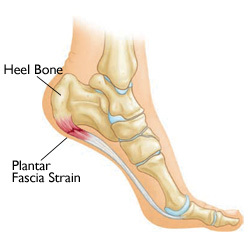 If we could just find a way to maintain tension on the plantar fascia at night wouldn't it heal much faster? Have you have ever had a cut on your knuckle and noticed how long it took for it to heal. Every time you bend your finger the skin is stretched and the ends of the cut are pulled open. Now imagine you made a fist, bent your knuckle, and let it heal stretched it in that position. It's going to heal much faster but you’re not constantly going back and forth between stretched and unstretched.